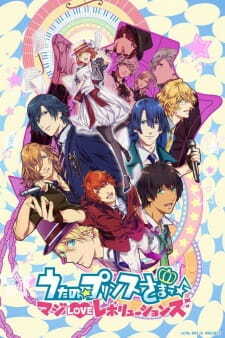 The third anime adaptation of the otome game Uta no☆Prince-sama♪. Starish are given new assignments in newly divided teams, and they do their best in order to try and impress Shining Saotome into allowing their entry to SSS, a top level music contest. Meanwhile, Haruka works with the Quartet Night. Notes: There’s a TL;DR with pros and cons listed near the bottom if you don’t feel like reading the whole thing. There are very minor spoilers in this review. Also, this review is mostly for those people that haven’t watched Maji Love Revolutions yet (I’ll just be calling it MLR) and have watched the other 2 seasons and want to know if it’s worth watching but people who have already watched it are welcome to read it too. This is also my first review, so feedback is greatly appreciated. When I heard Utapri was getting a third season, about a year and a half ago, I was pretty excited, I really liked the first two seasons and I just really couldn’t wait until MLR aired. Was it worth waiting a year and a half? Nope. The only feeling I got after watching it was disappointment and the impression that the writers really didn’t care most of the time about what they were writing. Most of the time. There were some good parts but they couldn’t make up for all the flaws, thus warranting a meager score of 4. I’ll explain each of the show’s strengths and flaws more clearly, but first I’ll elaborate on the plot a bit since MAL doesn’t provide a proper synopsis. There’s a sporting event coming up and either STARISH or QUARTET NIGHT (their rivals/mentors) will get a chance to perform the opening ceremony, in front of hundreds of thousands of people. QN was initially the one who was offered to perform, since they’re a more experienced group but since STARISH has been gaining more and more popularity, they might be able to perform in it instead. So now STARISH has to prove that they’re good enough to perform in front of all these people. Shining Saotome comes up with a “cross unit” project, where STARISH splits up into 3 groups (which means we get duets this season) and do all sorts of things that idols usually do to gain publicity (go on variety shows, do commercials, etc.) to prove that they’re good enough to perform at the sporting event. In this season, QUARTET NIGHT gets a lot more screentime compared to season 2, so you’ll be seeing them a lot, by the way. Each episode follows the same format: Haruka has to compose a song for the group/QN member (that has a gig coming up as well) to sing at said gig, they come across some problem, Haruka (and sometimes all of the guys) help solve the problem, they perform the song she wrote, it’s a huge success and that’s it. Pretty much. Almost every episode follows this format, except in the first 2 episodes, and in the last 4. Now onto explaining each component’s flaws and strengths. Get what I mean? These type of lines don’t help advance the plot and are essentially useless. It’s actually quite astonishing the number of times the writers have used this “trick” to help pass the time. Even worse is when the characters say LITERALLY the exact same thing multiple times, like an echo. Despite it having a romance tag and being based on an otome game, there is next to no romance, which is a shame, because most of the guys actually have nice chemistry with Haruka but the romance aspect isn’t developed upon at all. And that makes no sense either, since the guys are only in this in the first place BECAUSE they love her so much. So yeah, there’s almost no romance. Another thing worth mentioning, there are lots of cringey/facepalm-worthy things in MLR. For example, the overuse of the word “revolution.” I swear I can’t hear it in history class anymore without cringing, ugh, they just…really overuse it. Especially Shining Saotome, I kind of pity his voice actor, having to say it so many times. One last thing, they ended this season with a cliffhanger. Why? I have no freaking idea, it was completely unnecessary. We need a proper conclusion. And right now we don’t know when we’ll get a continuation, so we’ll have to wait who knows how long. Despite all these flaws, there are some good points. There were ELEVEN guys in it and everyone managed to get their time in the spotlight. Also, there were a good number of comedy scenes. Sure, the comedy wasn’t cleverly written or anything but it was enough to make me blow air out of my nose really fast. Something I really liked, and something that I thought was good for developing our MC and her relationships, were those scenes where she would go out of her way to help the guys with their problems and cheer them up. Those scenes might not really sound like it, with the way I’m describing them, but they’re pretty heartwarming and it shows that she really cares about these guys and wants to see them succeed. These type of scenes were sparse but still nice whenever they came on. The animation is very inconsistent. During the first half, there were few quality drops, nothing too noticeable, however, in the last few episodes, there were more of them than before, like the animators lost all their passion and started to get lazy. Misplaced eyes, disproportionate bodies and lack of shading were all prevalent in the last couple of episodes. Some movements looked stiff/robotic, especially for repetitive motions but nothing too bad. Oh yeah, they, uh, also used CGI in the ED. It looked super weird, to say the least. Good points: The colours were bright and pleasing to the eye and for the most part, the movements were fluid. Something that Utapri does with its artstyle that I haven’t seen in any other anime (yet) is that they put a little gradient on the shadows in the characters’ hair. It’s just something minor that they do to make the art prettier, but I thought it was worth mentioning. Some of the songs’ backdrops looked nice but overall, the backgrounds looked pretty average. The BGM and voice acting were pretty average, as well. A very noticeable difference in quality in this season and the other 2, is that the songs are not as catchy and memorable. I still liked them, but for most of them, I had to replay it a couple of times to really “get” the song. They were all sung perfectly well, with emotion and enthusiasm when called for, so I’ll give the VAs that. The OP song, “Shine” sung by Miyano Mamoru was a pretty good OP song and I didn’t skip it not once. I actually liked it more than most of the insert songs. The ED is not a very unique song (it has a similar sound to Maji Love 1000% and 2000%) and was kind of hard for me to actually get a feel for, but after listening to it after every episode, I really came to like it. I also never skipped it. Overall, the sound department didn’t blow me away, but I’m pretty satisfied with it. QN got more screentime this season compared to last season, so you’d think they’d get more development, right?.....well, nah, not really. Some of their members’ backstories revealed in the games were not explained. They were hinted at but not fully explored, which doesn’t help with character development and since they aren’t properly developed, you probably won’t feel anything towards those members. Another problem with QN was that their chemistry/interactions with each other (and Haruka) really sucked. Each individual member is fine, but when they’re all together, it’s a total snoozefest. Their interactions were just plain dull and probably only one, maybe two of them could have a chance with Haruka so you can’t really see them as real love interests, either. Overall, very few characters got development, so they all stayed the same, pretty much. Most of them were still entertaining to watch, but it would’ve been nice to get more character development. Good part, though, I found that STARISH’s interactions with each other and Haruka were pretty entertaining and handled well, for the most part. STARISH’s members seemed to have grown closer to each other, like they trust each other more (compared to their relationship in the other seasons, imo). I felt like their relationship really improved in this season. For example, in episode 2, someone (I forget who exactly) said “I’m glad we met” and when Masato and Tokiya had trouble coming up with lyrics for their song, EVERYONE helped them get past that obstacle, as opposed to just Haruka helping (which is what usually happens in MLR). These sort of things really helped show that they grew closer as a group. Some parts I really enjoyed while at other times I just really wish time could go faster. I’m still disappointed with what we got but I don’t necessarily regret watching it or anything. If I didn’t enjoy it, not even a little bit, I wouldn’t have watched every episode. Most of it was bearable. Even with nice scenes here and there, it wasn’t enough to make up for all the flaws. It was incredibly boring and hardly anything ever happened. I only suggest you watch this if you really love the series as a whole, you really love the characters and want to see more of them and their interactions, or if you feel obliged to watch MLR after watching the other 2 seasons and want to have all 3 seasons neatly lined up next to each other on your list. Otherwise, don’t bother. I was really excited for Uta no☆Prince Sama♪, especially after the great commercial success of Maji LOVE's 1000% and 2000% seasons. I have a love/hate relationship with reverse harems, mostly watching it because BISHOUNEN, but Prince Sama became a favourite after the depth they went into character development and non-annoying (not a word; don't use it) female lead who doesn't know how to do anything other than be torn about which guy she likes better because they all got equal screen time. However, Revolution was a considerable disappointment. It lacked the vigor that innovated me to change my skepticism about harems and come to love the series; personally I found myself skipping through the episodes rather despondently. It played the usual aesthetics of reverse harem storylines (plot twist: ROBOTS. I don't know whether this was supposed to creative or a desperate attempt at creativity), ups and downs in the boys' lives, making us remember why everyone loves the MC and blah blah blah — but wait! HELL YEAH. Alrightly, let's get down to the nitty gritty; the first and foremost important thing about Revolutions is the music, which is vibrant, cheesy, and catchy. You cannot not like the songs these boys have to sing, +idol dancing, this is the greatest thing you will ever see. Ah, all the while Haruka picks up a few more (or like ten more) bishounen along the way. Let me also add, character development is mediocre. I put a five because it was literally "meh". Each boy finds himself and that's great and all, but it's also pretty much similar to every other slice of life reverse harem. However, at the end of the day I still love this show. And SEASON 4, I'M COMING FOR YA. BECAUSE GUESS WHOSE BACK AT THE END OF SEASON 3: It'll be a spoiler so lol no I ain't spilling! Yesss, and "these boys" are better than ever. So, to be honest, I'll probably end up watching season 4 too despite telling everyone how this anime hasn't evolved whatsoever since season one. When I watched the first season of this show years ago, I loved it. It was its own thing. Watching the second season, I still enjoyed it. But something went wrong with this one. It was repetitive and very boring. Nothing really started happening until the last few episodes. In a show where all the characters have been introduced already, it's so unnecessary to chop up episodes into little groups. The dialogue...don't even get me started on it. Not only does everyone feel the need to repeat EVERYTHING, when they don't, they're saying something generic and cheesy that seems all too forced to be quite honest. Nanami still has no *real* character. Just about every time someone says something to her, she repeats it in the form of a question. Her lack of character is getting real old, especially since everyone else seems to have lost theirs in order to repeat the same things over and over again. Yet, Quartet Night is still a bit of a highlight. They've changed and they haven't yet lost their individuality to be tape recorders. Originally, I had dropped this show, but I decided that I was going to finish it. It got a bit better towards the end, but it still could have been a lot better. Being a song major in my 8th year of college I thought this anime would help me get one step closer to my dream of reaching the top of the music world. That's not what I got. As a Huge fan of Love Live I had to give this anime a chance. I thought that the character development I had gathered from the last 2 seasons of this anime would make me fall in love with them more. NO! That's not what this is about. The bad pairing systems made the characters lose their shine. The bad CGI in this anime is HORRIBLE. How do you draw the characters so clean then mesh them together in such a bad fashion. The principal continues to get on my mind as he continues his antics of wanting a lawsuit to be filed against him. This anime does not make me feel comfortable because of his presence. If your a HUGE Love Live fan like myself with 8 years of college under his belt this anime will not give you the REVOLUTION you would hope that it would give you! These 20 quotes from the Uta no☆Prince-sama♪ series shows why it is perfect for influencing viewers to work towards their own goals!